Both sides fit great on our trial fit. 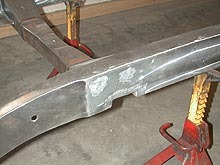 Now we line them up and get ready to weld them in place. The little "X" is for me to remember what side goes up. Just kidding, the right is slightly different from the left (about 1/32"). These were bent in a vice, so they were not both exactly the same, but who will ever know? Oops! I just told everyone! 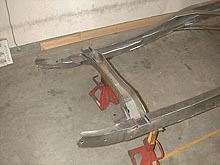 Here you see the frame with both plates. 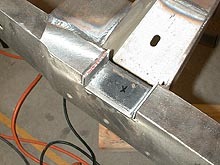 It's going to be almost impossible to grind the inside edge, so we will just do a nice bead and leave it at that. You'll never see it anyway. Once the pockets were welded into place we took an angle grinder to the visible areas and did our best to make it look as if it was always this way. Here's the finished product. 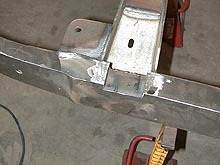 The un-needed boltholes are welded shut and ground, everything is nice and neat, and we are ready to begin the initial hanging of the front end.